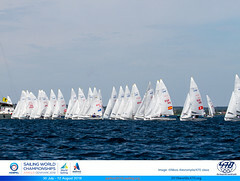 Racing at the 2012 470 Junior World Championship gets underway on 28 January through until 3 February 2012. Teams from 13 nations and four continents have gathered in Takapuna, New Zealand ready to do battle for the 470 Junior Men/Mixed and Junior Women World Championship titles. Organized by the 470 New Zealand Class Association, Takapuna Boating Club and International 470 Class Association, the 2012 470 Junior World Championship will match hot favourites alongside relative newcomers to the class. To be eligible to compete, both helm and crew must be aged 21 years or younger in the year of the Championship. The Pre-Worlds Regatta, which concluded earlier this week, has been an initial indicator of form and included New Zealand’s 470 Olympic representatives who were impressively beaten by the junior team of Matthew and Robert Crawford (AUS). A stunning result which propels the Crawford brothers into pole position as gold medal contenders, whilst Erica Dawson/Vicky Francis (NZL) finished as the top junior women’s team. Not all Junior World racers competed at the Pre-Worlds, and with a few more days of training and race course familiarity under their belts, there is any number of teams who will be leading the fleet and challenging for Championship glory. The majority of the teams have participated in the pre-Championship Racing Clinic led by world class coach Nick Drougas GRE), from 24-26 January 2012. The 470 Women’s fleet includes the defending 470 Junior World Champion Annika Bochmann of Germany. Bochmann’s medal winning crew from 2011 is too old to compete, and stepping up to the challenge is Elisabeth Panuschak. 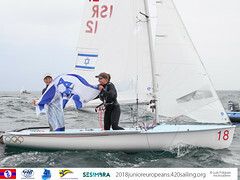 2012 marks Bochmann’s last year eligible to compete in the junior fleet, so she will be on a mission to conclude her junior career with another gold medal. Bochmann’s achievements also include the silver medal at the 2011 470 Junior Europeans, silver at the 2010 470 Junior Worlds and gold at the 2010 470 Junior Europeans. To say she has 470 experience is an understatement. Combine this with a world ranking of #37 and this pair is unquestionably one of the teams to beat. Anna Burnet/Flora Stewart from Great Britain won the medal race at the 2011 470 Junior Worlds, but could not catch up with the Germans, and finished with the silver medal. Last year their score line was peppered with double-digit race finishes, and to secure the gold medal in 2012 they will need to deliver a more consistent score line. 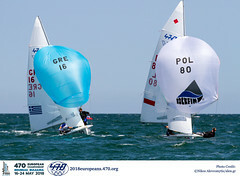 Sitting just two places ahead of Bochmann on the ISAF World Rankings at #35 are Afrodite Kyranakou/Jeske Listers (NED), who are fresh from elite fleet experience and a 30th place finish at the 2011 Perth ISAF World Championships. They finished seventh overall at the 2011 470 Junior Worlds and, with more experience racing together are geared up to challenge for a podium place. Australian Sasha Ryan secured the bronze medal at the 2011 470 Junior World Championship, with crew Chelsea Hall. As Hall is too old to compete in 2012, Ryan has teamed up with sister Jaime; reminiscent of their 420 racing days together. Sasha has delivered some top results with Hall in the 470, including a 40th at the 2011 Perth ISAF Worlds; experience which will serve the sisters well in New Zealand. Three 470 women’s teams will keep the host nation’s ambitions alive with Bianca Babarich-Bacher/Julia Francis, sisters Sarah and Emma Berry and Erica Dawson/Vicky Francis competing. Of the three, Dawson/Francis are most probably the most experienced in the 470 and are another team to have competed at the ISAF Worlds in Perth where they finished 43rd. However, Babarich-Bacher is used to the pressure of being a series leader and won the 2009 420 Women’s World Championship as crew. The sibling relationship between the Berry’s has also delivered strongly in the past, including a fourth place at the 2007 420 World Championships in Takapuna. 470 Women’s teams from Ireland, Japan and the Netherlands are also competing. In the 470 Men/Mixed event, one of the favourite teams will be Australians brothers Matthew and Robert Crawford. They have just won the Pre-Worlds regatta, ahead of New Zealand’s 2012 Olympic 470 teams, Paul Snow Hansen/Jason Saunders and Jo Aleh/Olivia Powrie. Whilst their form at the 2011 470 Junior Worlds in the Netherlands was not too impressive with a 25th place finish, they upped their game to finish fourth overall at the 2011 470 Junior Europeans. They have also gained from their experience at the Perth ISAF Worlds finishing 46th in the 80-boat 470 men’s fleet and are looking highly competitive. The top ranked team competing in New Zealand are the world #52 pairing of Simon Sivitz Kosuta/Jas Farnetti from Italy. They finished just ahead of the Crawford brothers to claim the bronze medal at the 2011 470 Junior Europeans, and secured a bronze medal at the 2010 470 Junior Worlds. Also on the challenge will be France’s Sacha Pelisson/Nicolas Rossi, who have featured in the top 10 at each of the 2011 and 2010 470 Junior World and 470 Junior European Championships. 2012 could well be their year to move on up and claim a 470 Championship medal. Five New Zealand teams will challenge for host nation glory, and past form points favourably to Luke Stevenson/Sam Bullock who were one of the top junior teams at the Perth 2011 ISAF Worlds finishing 57th. Another contender is Finn Drummond, who secured the silver medal at the 2009 420 World Championships, and is sailing in a new partnership with Matthew Turner. Several teams are relatively fresh from converting to the 470 from the 420, including Pablo Völker/Agustín Cunill Martinez who have made the trip from Argentina. They were crowned 2011 420 World Champions in January last year, and made their transfer to the 470 a few months later, finishing 16th at the 2011 470 Junior Worlds and 11th at the 2011 470 Junior Europeans. As reigning 420 World Champions, they are benefiting from the 470 Development Programme, which has awarded them free entry to the 2012 470 Junior Worlds. Facing off against them will be other 420 protégés, including 2011 Open 420 European Champions Alex and George Kavas (GRE) and 2011 420 Open Junior European Champion crew turned helm Alex Gough (AUS). Brothers Alex and George Kavas enjoyed a stunning 2011 in the 420, winning the 2011 420 European Championships and finishing third at the 2011 420 Open Junior European Championships, and their rivalry with the Australians will come head to head again in Takapuna. Aged 15 years, Alex is amongst the youngest helms competing and brings an infectious enthusiasm to his sailing. The brothers are an impressive pair, who have uncompromising determination and will be keen to score a podium finish at their first 470 Junior World Championship. Alex Gough is more familiar with the front of a boat, but with his usual helm Angus Galloway too old to compete at the Junior Worlds, Gough has substituted himself with Scott Cotton on the trapeze. Angus and Alex made their leap to the 470 last year, soon after securing the bronze medal in the 420 at the ISAF Youth Worlds and winning the Open 420 Europeans. They threw themselves into the Perth ISAF Worlds and finished 66th, and we look forward to see how Gough now performs with a tiller in his hand. There is one mixed team competing, sister and brother pairing, Lucy and Douglas Shephard (AUS). The siblings have moved from the Cadet dinghy to the 420 and now compete together in the 470 at their first 470 Junior World Championship. Austria, Denmark, France, Germany, Japan and the Netherlands also have teams competing in the 470 Men/Mixed event. The 13 race series includes 12 qualifying/final races and the Medal Race. The official practice race and Opening Ceremony take place on Friday 27 January, with racing getting underway on Saturday 28 January and concluding on Friday 3 February 2012. The Championship is being co-ordinated by Commodore of the Takapuna Boating Club Eveyln Johnson, with the International Jury led by Nino Shmueli (ISR), Ian Clouston (NZL) as Principal Race Officer and Heinz Staudt (GER) as Chief Measurer.